Hey! This our blog on Renaissance Innovation. Here we plan to share our latest research, case studies and thoughts on ideas that disrupt industries, revolutionize the business landscape, and generate immense wealth– all by selling exactly the same products as competitors to the same customers, but by reinventing the operating model of the industry. We call such ideas, and the process of identifying, generating and refining them the The Renaissance Innovation Method, or simply Renaissance Innovation. Who is a Renaissance Innovator? Henry Ford had an idea. Michael Dell had an idea. Amancio Ortega had an idea. These ideas revolutionized the automobile, computer equipment and the fashion apparel industries, created immense wealth and spawned many imitators. But none of them invented a new technology or significantly changed the product that their competitors were selling. Instead they reinvented the operating model of the industry, or the way in which the industry makes or sells the product. Henry Ford’s assembly line represented a radically different production process for the automobile. Michael Dell decided that it was better to start assembling computers on order, rather than in advance of orders. And Amancio Ortega felt that when it comes to fashion apparel, speed and responsiveness to the latest trends was much more important than keeping costs low. Each of these represented a different operating model for the industry and the companies they found, Ford Motors, Dell Computers and Zara all used the strength of this different operating model to become industry leaders and forever transformed their respective industries. Why call it Renaissance Innovation? 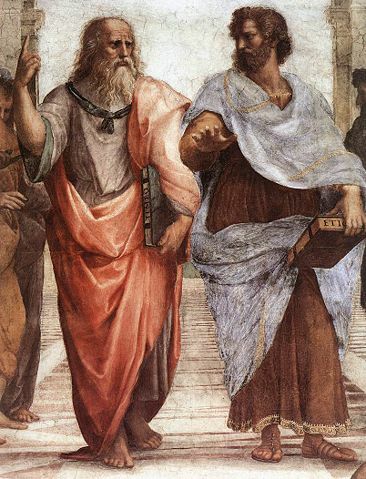 Plato (L) and Aristotle. Aristotle gestures to the earth, representing his belief in knowledge through empirical observation and experience, whilst Plato gestures to the heavens, representing his belief in the forms. Innovating the operating model of an industry is different from developing new products or going for new markets. These innovations can be generated, refined and examined systematically using familiar analytical tools, bringing a new scientific method to the art of innovation. They often completely revitalize companies and competitive industry sectors, sectors which were thought to be in the dark ages of commoditization and not ripe for disruptive progress. In the same way as Renaissance era thinkers brought the scientific method to the study of anatomy, astronomy, physics and biology to radically advance human knowledge in these domains, we believe the renaissance innovations can do the same for many commoditized industry sectors, thus leading to a rebirth and a period of rapid progress. Read more about us and see us talk about Renaissance Innovation. Good going guys…a similar message, but in a slightly more oblique fashion is conveyed in the Black Swan’s last chapter. Taleb talks about investing/experimenting with projects where the payoff is positively skewed and downside risk is balanced (“known unknowns” instead of “unknown unknowns”). Enjoyed reading your blog. I like the post and the way you deal with it….. I am also teaching the same business model Innovation to my student in Design Management Module at National Institute of Design, India. You have given it a good name too. Would like to get connected and learn and share . . .
i like the idea of blog and absolutely agree that in many cases people are mixing two completely different meanings: product and business model innovation.